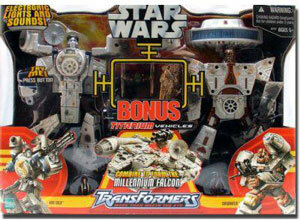 Description Of Item: Star Wars TRANSFORMERS figures are awesome, mechanized ?mech? versions of your favorite heroes and villains that change into their signature vehicles! This incredible collection of mode-changing figures is definitely MORE THAN MEETS THE EYE! Combine Han Solo and Chewbacca together to make a Deluxe Millenium Falcon. This set includes two BONUS Titanium ships.